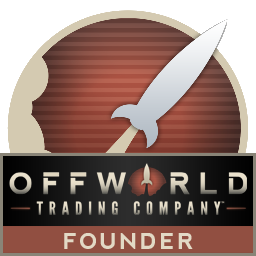 Offworld Trading Company Beta 10 is now available. This update includes a variety of improvements and fixes including new custom maps, new building auctions, optimized multiplayer, and more. New custom maps are available! Buying out a player costs less the more shares of them you own. Stock value now takes into account whether you are Expansive or Scavenger when valuing your buildings. Adjusted stock delay after buyouts. Pleasure Dome now gets +10% per adjacent housing module (instead of +16%). Bond rating thresholds now scale from 2 to 8 players. Water and carbon is no longer guaranteed on maps with ice and dry ice, respectively. Power Surges, etc. no longer have "bad bounces"
Added Pause Selection mode where the game pauses in single player while you are founding, claiming, building, etc. AI is better at founding with Reveal Map on. Reveal map timer is a little slower. New Scavenger HQ art and animation! New Art for Colony Hub! Fixed terrain shaders for ambient lighting. Placeholder Solar Flare effect is back, baby! Animation polish for elemental quarry, engineering lab, and scientific electrolysis reactor. Nighttime animation for solar panels. Reduced network traffic by half! Add code to display the number of people waiting for a ranked match while waiting for a match so people playing 4 Player FFA quick match can see that other people have joined the wait and how many. Changed it so the player's handicap is the default handicap instead of none which speeds up the process of joining a lobby. Colony now has a name visual and HQs now have a player name visual. Added a warning popup if you try to found too early with Reveal Map on. 7 Sols end game screen added. Blocking input while the game is loading. Preventing hotkeys and mouse input from firing. Multiplayer observers are automatically ready and the ready button is disabled. In-game campaign results screen improved. Adding a gameplay tip while the game is loading. Displaying resource icon in region text. Build panel is always up. Until it's not when you close it. But if you open it again it is sticky. Resource ordering: moved silicon next to carbon as Dorian requested. Now showing building connection lines to constructions as well as buildings. Showing potential dividend in buy stock button for subsidiaries. Enabling MapSeed field in Skirmish & Multiplayer settings screen. The map seed can be found in the main game's escape menu. Resource rates now show buildings that are short of resource input. Reworked cursor and selection logic. Added Random options for resource presence and minimums. Clicking on a player's name will now select their HQ. Added mouseover help for sabotage if tile is invalid. Added 6th song to the game. New win & lose end game music. “Quickmatch thrill ride” sound effect added back in. Added delay ability to sounds and made the found & upgrade slightly delayed so they don't smash on top of the music fanfares. When you set the music to zero volume in the options window, the volume changes appropriately. Tutorial 2 is now ready to play! Added “Show Total Cost” player option. Added “Hide Build Menu” player option. Added “reset” to skirmish and campaign games. Moved replay files into a "Replays" sub-folder. Add the file picker for selecting a replay file to playback from the main menu. Also added a popup to show if you selected a file that it can't play back and what version of the game it was created with. Added file picker for saving and loading skirmishes. Daily Challenge replays now work! Fixed bug where you could resign, go back in as observer, and then resign again in Skirmish mode. Fixed bug where you could resign, go back in as observer, and then couldn't exit the game in multiplayer mode. Fix for trying to resume a ranked match when the game is over. Fix so that exiting a non-ranked lobby game takes you back to the find lobby screen. Fixed where "Exit and Save" option was available when playing back a replay. Fixed being able to existing and saving a game from a replay and exiting and saving a game after the play has conceded. Fixed save games to have the correct game pause state. Fixed HQ hotkeys not working. Fixed a bug with where the "save and exit" option takes you from a campaign.